Sunday School – Sunday School is available for children ages 3 through 5th grade. Children and teachers explore scripture using the Lectionary based curriculum, Feasting on the Word. For more information about Sunday school contact Lauren Blanchard in the church office. Children’s Chapel – Children ages 3 through 5th grade are invited to attend Children’s Chapel each week during the 10:30am worship service. Children explore Liturgy and Scripture in age-appropriate and fun ways. Children return to the service during the Peace and join their families for Communion. For more information about Children’s Chapel, contact Deana Graham at graham.deana@gmail.com. Guild of the Christ Child – This guild is dedicated to making Baptism a memorable occasion for children and welcoming infants into our parish family. For more information contact Courtney Twigg at courtneytwigg@aim.com. Youth Ministry – Our youth ministry group meets regularly on Sunday evenings from 5:00-7:00. Occasionally they gather at other locations and other times. This group is open to all middle and high school students. On Wednesday night youth volunteer to help with children’s music and art programs. On Tuesday nights Senior High girls meet for bible study. For more information contact Lauren Blanchard at trinity.laurenb@gmail.com. InReach – The ministry of the InReach committee at Trinity assists our clergy in nurturing and caring for parishioners. This team strives to answer God’s call to care and aid one another by reaching out in tangible ways to families in time of transition, such as death, illness, hospitalization, or the arrival of a newborn. The types of care provided by InReach may include preparing and taking meals to those who are suffering from illness or recovering from surgery, arranging and delivering flowers from the Trinity altar to parishioners in the hospital or unable to attend services, assisting with funeral visitations or receptions, or the simple kindness of sitting in a home while the family participates in the funeral of their loved one. For more information contact Debby Kemp at debbykemp@yahoo.com or Linda Shinkle at lsh3111@aol.com. 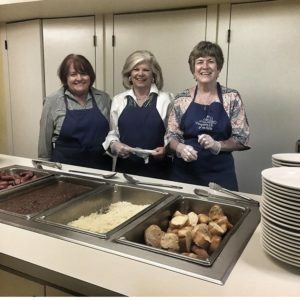 Kitchen Brigade – This is a group of volunteer parishioners who cook and serve the Wednesday night meals, prior to the Wednesday night programs. For more information about volunteering to cook or serve, contact Sandra Rodgers at sandycoker58@gmail.com, or Ruth Yancey at rby6049@charter.net. St. Lydia’s Guild – This guild meets monthly for dinner and fellowship and sponsors two annual events, The Shrove Tuesday Pancake Supper, and is a fundraiser for needs within and beyond the parish. For more information contact Mary Johnson at msugarbear@gmail.com. Healing Prayer – Prayer Intercessors are available after the 8:00 am and during the 10:30 am services to provide care and comfort to those in need. The volunteers that provide this service are trained to minister help to the needy. For more information contact Nell Hudson at nhudson63@gmail.com. There is also a Prayer Group that meets on Wednesday mornings at 11:00 to pray for the needs, cares and concerns of our parish family, our city and beyond. Anyone interested in this ministry is welcome to join this group. For more information contact Deborah Cooper at deborahjcooper@yahoo.com.